Local law enforcement raided one of California’s leading medical cannabis extract providers in Santa Rosa today. Properties held by AbsoluteXtracts and Care By Design were raided in Santa Rosa today by local law enforcement, with Drug Enforcement Administration agents observing. According to reports from the Press Democrat, Sonoma County law enforcement agencies led a series of raids focused on cannabis extraction facilities, and at least nine people were detained. The police visits occurred at a business park on Circadian Way off Corporate Center Parkway. Care By Design spokespeople confirmed the raids hit AbsoluteXtracts and Care By Design properties in Santa Rosa. The Sonoma County Sheriff has not issued any statements about the nature of the raid. Local lobbying group the Sonoma County Grower’s Alliance plans to lead a response to the actions. “Care By Design has worked tirelessly over the past year to ensure that all of our facilities, employees, company policies and procedures are in compliance with city, county and state laws. We have planned for this type of situation and are fully confident in our ability to resolve this matter expeditiously with minimal disruption to the business. We hope to resolve this before it affects our thousands of patients throughout California,” a Care By Design spokesperson stated. California regulated medical marijuana in black and white last year, but with rules set to take effect by 2018, there’s plenty of gray area at the local level. 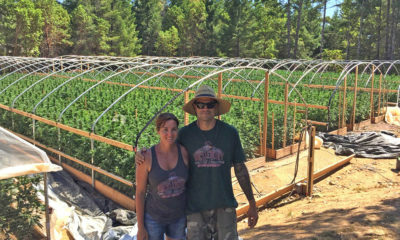 The area, and Sonoma County in general, is a hotbed of cannabis extraction due to local expertise and access to prime sources of raw cannabis. The vast majority of California cities and counties have not yet regulated the industrial activity. Care By Design and AbsoluteXtracts are award-winning makers of precision-dosed extracts in oral and inhalable forms. In 2015, they were product partners in the world’s largest medical cannabis competition, The Emerald Cup. The sweeping hash lab raids fit a statewide pattern of local takedowns — on either the biggest farms or the biggest extractors — including the Med-West sweep in Southern California, and recent 3,000-plant grow in a Santa Rosa. CA. front yard. “It’s low-hanging fruit,” said an ASA spokesperson Terry Best. No arrests in the Care By Design raids have been reported, she said. Care By Design founding member Dennis Hunter was arrested and is being held in Sonoma County Jail on a $5 million bond, the company states. The company states deputies arrested Hunter and charged him with felony manufacturing of a controlled substance by chemical extraction (a law created for meth labs). According to a press release from Care by Design (released after this story was published I’m sure) the company owner was arrested and was being held in the Sonoma County Jail on a $5 million bond. $5 million!!! For a 100% compliant (as you can be anyway) CO2 operation that serves thousands of patients! !